No wires, no assembly–just place in bath! 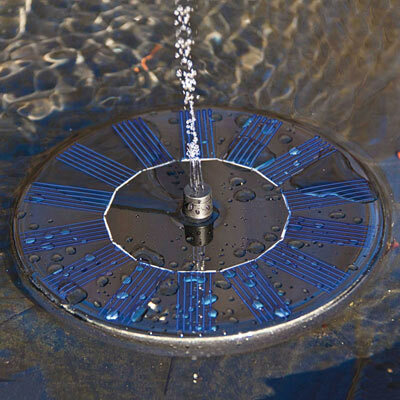 Makes water shoot up 4–5"
Both the fountain and the solar panel are in the round base, so there are no wires or external batteries! Water flow is dependent on the strength of the sun; starting after 3 seconds of direct sun, water will begin leaping 4-5 inches high to provide plenty of movement, but not so much it splashes out of the basin. It even works on overcast days, though it pulses rather than providing a steady stream. 6-1/4″ diameter.